A core group of people that can be relied on to be there regularly. Indeed the debut session occurred on a minus-18 degree night in January 2009, with over 25 musicians in attendance. Since then, that core group has rarely wavered in its attendance, and overall attendance has averaged in the high-teens to low-twenties. Firm but gentle leadership, to welcome newcomers into the fold, and ensure session etiquette was fostered among all. Over the five-plus years since, Lucy Cummin, Paul Wheeler, Maria Wicker, Joyce Wolpin, and many more have become mainstays at On The Rise. Musicians have traveled from Massachusetts to join us, and we even had a surprise visitor passing through from Norway! 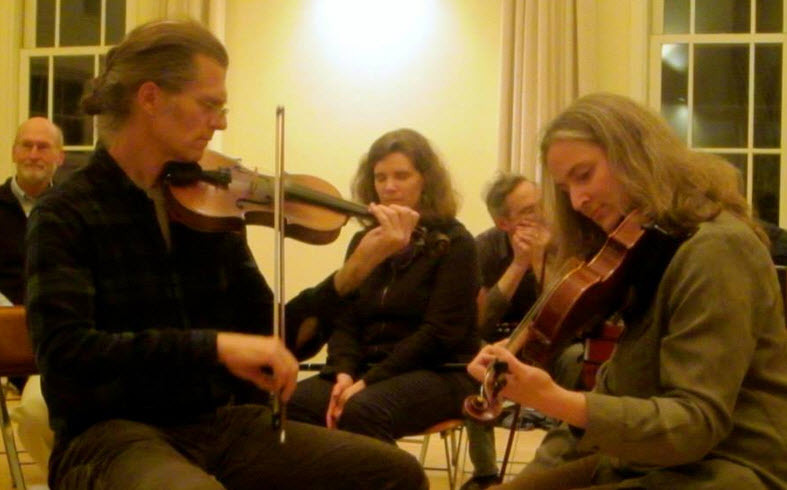 We’ve tended to think of our session as a session “for the rest of us” – not the fast and flashy virtuoso musicians, of which there are countless in Vermont, but those who rejoice in the relaxed pace and melodic phrasing of the East Galway and County Clare regional styles. Indeed there have been some dazzling displays of fiddling, fluting, piping, etc., but rarely without a return to our core principles. “Every session has a lifecycle.” Alas, the fine proprietors of On The Rise are moving on the next chapter of their lives, and have sold the venue to other Richmond restauranteurs. We wish to express our utmost gratitude to Rachel Barone, Ben Bush, Derick Burkins, and all of the outstanding staff at OTR for their unwavering support over the years. “Every session has a lifecycle.” The final session at OTR will be this Thursday evening, Sept. 25, from 7:30-10:00. We hope you are able to join us to give the session the rousing send-off that it deserves. Your Humble Hosts believe that every ending is yet another beginning, and as we bid farewell to On The Rise, we hope to catch lightning in a bottle one more time, and start up at another area venue. Please keep your eyes and years peeled, and keep you repertoire sharp. “Every session has a lifecycle.” From Glen Allen/The Old Copperplate to The Spike Island Lasses; from Cuil Aoudha/Tatter Jack Walsh to Scatter the Mud/The Legacy; from The Congress/The Green Groves of Erin to The Spike Island Lasses to Colonel Rogers/The Happy Days of Youth, we bid you a fond farewell, until we meet again. Loved reading this piece Katrina – perfectly expressed my thoughts about the OTR session. Hopefully a new venue will continue to nurture us!